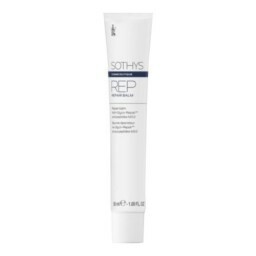 Rebalancing balm to intensely accompany day and night skin that has been ultra-weakened by dermo-aesthetic procedures. REP Repair Balm is a lipid based emollient rebalancing & repairing balm to soothe and repair skin and reduce sensations of tightness and discomfort following dermo-aesthetic procedures including Clinical Peels (level 2, 3). It supports epithelial growth factors to repair and regenerate healthy skin cells, assisting the restructure of dermal proteins in crossed-linked Collagen to re-densify the skin. Glyco-Repair is an aqueous plant extract from Carob seed rich in natural oligo-galactomannans, that stimulate the migratory potential of the skin cells, regulating the dermal repair mediators involved in the skin regeneration process. It contributes to the repair of micro-tears in the skin. Soothing Complex is an optimal combination of active ingredients selected to regulate inflammatory phenomena - including extract of Brown algae, D-Panthenol, Allantoine. Extract of Baldo is a plant extract to promote and protect the healthy microbiome (micro flora) of the skin. Moisturising Complex is a combination of active ingredients renowned for their ability to maintain optimal nutrition and hydration - Glycerine, Urea derivative, Hyaluronic acid, Cucumber extract, Shea butter, Phospholipids. *Dermatologically tested on skin following abrasive Laser treatment and chemical peeling. *High tolerance hypoallergenic, fragrance & colourant-free, efficiency proven under dermatologists supervision. Aqua (Water), Bulyrospermorri parkii (Shea) oil, Glycerin, Butyrospermum parkii (Shea) butter, Dicapryly1 carbonate, Cetearyl alcohol, Caprylic/ capric triglyceride, Tapioca starch, Butylene glyco' Glyceryl stearate, PEG-100 stearate, Ceteareth-33, Hydroxyethyl acrylate/sodium acryloyldi-methyl taurate copolymer, Panthenol, Propylene glycol, Lecithin, Squalane, Allantoin, Disociium EDTA, Sodium dehy-droacetate, Xanthan gum, Peumus boldus leaf extract, Pentylene glycol, Ceratonia siliqua (Carob) fruit extract, Sodium styrene/acrylates copolymer, Polysorbate 60, Tocopherol, Citric acid, Glycine soja (Soybean) oil, Laminaria ochroleuca extract, Chlorhexidine digluconate, Polymethylsilsesquioxane, Carbomer, Sorbitan isos-tearate, Sodium lactate, Helianthus annuus (Sunflower) seed oil, Potassium sorbate, Phenoxyethanol, Polysorbate 20, Ethylhexylglycerin, Rosmarinus officinalis (Rosemary) leaf extract, Palmitoyl tripeptide-1, Palmitoyl tetrapeptide-7. Application to face and body. Disperse 2mls-5mls+ on the skin immediately following the treatment for 7 to 14 days, morning and evening. A Sothys Sun Shield MUST be applied during day-light hours to protect fragile, vulnerable skin from strong UV damage.